When bedrock is subjected to a cycle of glacial loading and unloading the resultant changes in hydrostatic stress can affect the permeability of the rock. Assume that bedrock is purely brittle, not plastic, and that it initially lacks voids. Then, under hydrostatic stress, homogeneous rock will undergo an elastic (100% recoverable) strain whereby fractional volume decreases proportional to the stress. The constant of proportionality is the bulk modulus of the rock. When the rock is homogeneous, no faults or voids will be formed under hydrostatic loading. Bedrock is often a heterogeneous mixture of various minerals. The bulk modulus of heterogeneous bedrock will vary spatially meaning that not all sections of the rock will compress equally under hydrostatic loading. In the diagram above, blocks of rock with differing bulk moduli are shown uncompressed and compressed. For simplicity, the outer shell of rock (black) is assumed to have a bulk modulus of infinity (incompressible) while the inner blocks (grey) have finite bulk moduli and shrink relative to the outer shell when loaded. Two important effects result from applying load to the heterogeneous rock. Firstly, sections of rock slide relative to each other creating faults. Secondly, differential volume changes in different sections of rock cause voids to open between sections. Both of these effects can increase the permeability of the rock and allow groundwater to penetrate the rock and move within the rock. The bulk modulus of rock is high relative to the pressures typically associated with glacial loading. For example, the bulk modulus of quartz is 38 GPa, the bulk modulus of plagioclase feldspar is about 76 GPa, while serpentine has a bulk modulus of about 70 GPa. In contrast, the hydrostatic pressure generated by ice load at the base of a 500 m thick ice sheet is about 4.5 MPa. Thus, bedrock underlying 500 m of ice will undergo a fractional volume reduction of the order of 1 part in 10000. Even with the high ratio of bulk modulus to loading pressure, large volumes of bedrock could still absorb significant amounts of water when loaded by ice. For example, consider a hypothetical cube of quartz 10 m on a side (volume =1000 cu. m) surrounded entirely by plagioclase and loaded with 500 m of glacial ice cover. The quartz block would shrink sufficiently relative to its enclosure to allow 60 kg of water to enter the intervening space. When permeable bedrock lies undisturbed in contact with groundwater for an extended period, permeability can decline as water reacts with minerals, dissolves minerals and precipitates dissolved minerals and reaction products. 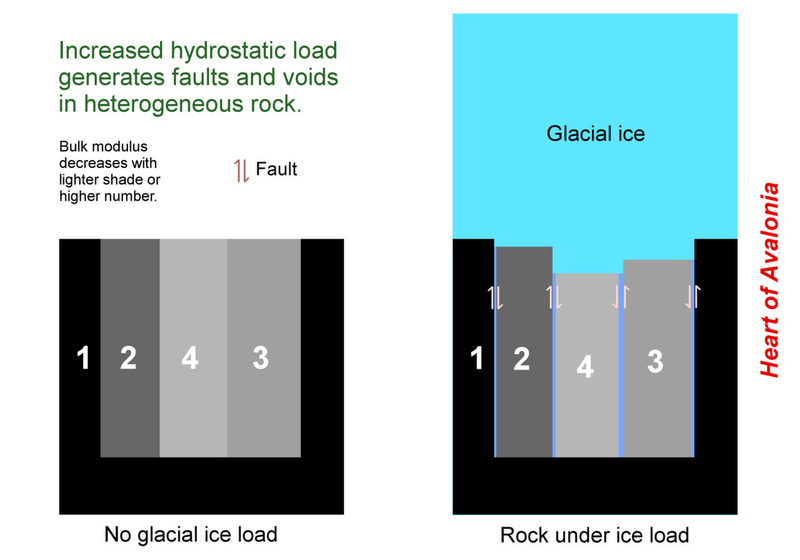 The action of glacial loading and unloading can reverse permeability loss and enhance the ability of groundwater to percolate through the bedrock. In summary, the effect of cycling ice load on heterogeneous bedrock can augment eventual frost wedging of the rock both by increasing the groundwater content of the rock (during loading) and by increasing the permeability of the rock and hence groundwater mobility. Given that hydrostatic stress causes only elastic deformation of bedrock, it is also possible that upon unloading, the voids formed during loading would diminish in volume, forcing absorbed groundwater back to the surface. This effect could significantly augment frost heave at the surface in cases where the surface rocks were frozen in a cooling climate during the interval that the returning groundwater made its way upward.